Entergy executives, elected officials and community leaders gathered to celebrate a groundbreaking marking the ceremonial start of construction on the Montgomery County Power Station. 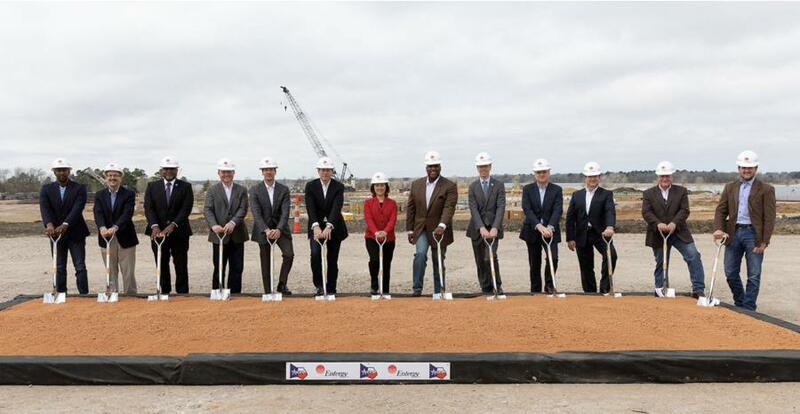 The shovels hitting the dirt on Feb. 15 marked a new chapter for reliable, affordable energy across Southeast Texas. Entergy executives, elected officials and community leaders gathered to celebrate a groundbreaking marking the ceremonial start of construction on the Montgomery County Power Station. In addition to meeting customer needs, MCPS also will have a substantial impact on the Texas economy. An independent economic analysis by TXP Inc. estimates that construction alone is expected to generate an estimated $1 billion in economic activity across the state. Additionally, construction is expected to create a multiplier effect of more than 7,000 jobs (direct, indirect, induced). Entergy Texas Inc. provides electricity to approximately 458,000 customers in 27 counties. Entergy Corporation is an integrated energy company engaged primarily in electric power production and retail distribution operations. Entergy owns and operates power plants with approximately 30,000 megawatts of electric generating capacity, including nearly 9,000 megawatts of nuclear power. Entergy delivers electricity to 2.9 million utility customers in Arkansas, Louisiana, Mississippi and Texas. Entergy has annual revenues of approximately $10.8 billion and nearly 13,000 employees.